Graying of hair and hair fall is common disorder, occurs with aging. Many people have trouble by these diseases. Therefore, In this article we are talking about a tremendous and magical method to get cure. It is Rubbing finger nails. 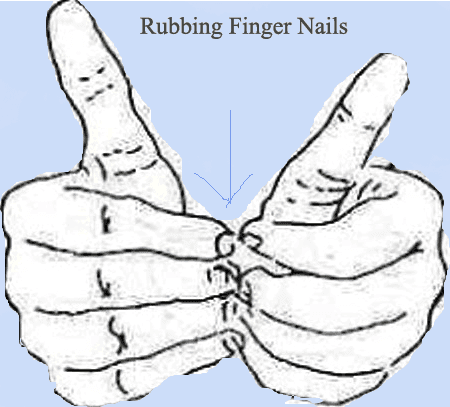 Rubbing finger nails to cure from hair fall & gray hair. 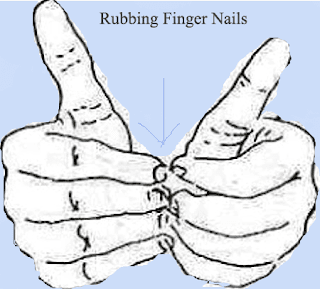 Rubbing left and right hand nails with each other as shown in figure, You can try this method anytime at home. It is feeling like a joke but it is working very well; it works like acupressure method. many of the people gets benefits by this method, therefore try this DIY method and gets relief from hair problem without ant treatments. In this method, first we have to folding our palm or fist off and then rubbing left and right hand nails with very smoothly. You can continue rubbing at-least 5 to 10 minutes. Thereafter, take a rest and start after some of the time. When you aren't busy then try it. Try it while watching TV, speaking with someone else. This is the powerful yoga and method to recovering of gray hair. Your hair will become strong,dense and long with this method. This method provided by Baba Ramdev (Yoga Guru) and Very predictable and experienced to solve all these problem. Hopefully, It would be helpful for you. You can leave comment for any suggestion or advice. This is a proven formula, mentioned by Yoga-Guru swami Ramdev. Mostly it will works but if you don't satisfy then you can use another remedies for it. me also doing from a long time but no improvement and got white hair more than before..